Buda Musique is justly famed for its amazing Ethiopiques series of music, and it has recently launched Zanzibara, a new collection devoted to classic tracks from East Africa. On a recent visit to the Buda website, I was surprised to note that there is no mention of its five-volume Angola series. Does this mean that it is out of print and abandoned? That would certainly be a shame. 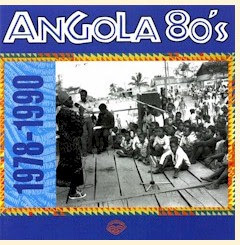 This groundbreaking effort documented the development of the Angolan music scene through four decades of turbulent history - from the struggle against Portuguese colonialism in the sixties, the civil war that wracked Angola following independence in 1975, and the "false dawn" following the Bicesse accords of 1991, which soon gave way to renewed conflict. It was only in 2002 that a measure of stability came to Angola, following the death in combat of Jonas Savimbi, whose UNITA faction terrorized the country for decades with the support of the CIA and the South African apartheid regime. The last few years have seen a renaissance of Angolan music and the rise of new styles, notably Kuduro. But that's beyond the scope of this post. Let's start off with a tune that was actually recorded shortly after Angolan Independence in 1975, so technically it's not within the purview of this discussion, but who cares? "Ministro Gatuno" apparently describes the disgrace of a government minister who was caught with his hand in the cookie jar: "Agostinho Neto [1st President of Angola], you should know, Samuel Abrigada stole some money. We saw you, we saw you, we saw you. We saw you when you robbed the money. Abrigada can't deny it, because we've seen for ourselves, and what he stole belongs to Angola." This track was included in a collection of what might be called "propaganda" songs for the ruling MPLA party, Angola: Forward, People's Power! (Paredon P-1041, 1978). Information on the artists was not available. N'Simba Simon, aka "Diana," was one of many Angolan musicians who made their way to the Congo during the dark days before the fall of Portuguese colonialism. In 1968 his career began alongside Tabu Ley Rochereau in l'Orchestre African Fiesta National, and from 1969 to 1973 he sang in Les Grands Maquisards led by Ntesa Dalienst. From 1973 to 1976 he rejoined Tabu Ley in Orchestre Afrisa. "Sim Senhora," from 1983's Marguerida (Editions Man-Im MAN 001), was recorded with the Congolese group Bobongo Stars, who are quite interesting in their own right. About a month ago I passed on a rip of their LP Makasi to the With Comb and Razor blog, and you can download it here. Finally let's hear a comparison of two versions of a traditional song, "Nguitabule." The first is by Rodolfo Kituxi, from the LP O Canto Livre de Angola (RCA Brazil 103.0585, 1983) and the second, from Angola 80s, is by Os Merengues, a very influential group founded in 1974. You might notice that I am no longer using DivShare for my downloads. So far it's working out great. Let me know how you like it.